A cold, wet day in Kyoto. I did not want to be here but since I was, I decided to go to Ryoanji, a few blocks from the hotel where I was booked. Because it was cold winter rain, I took a taxi instead of walking. The taxi driver was happy I was American. I sat in the back seat for the few moments it took. Several times I caught his eye in the rear view mirror, he always smiled. When I got out of the taxi handing him money, he waved it away. “American. Stranger. Cold.”..I could not in honor leave money after that. I bowed deeply to him as he drove off. I hoped he would look in his mirror and see. I was alone on the viewing platform overlooking the dry garden. I stood looking in silent awe. On top of the wall was a row of sparrows. All fluffed out, eyes bright with curiosity, they watched this Western stranger move from one end of the platform to the other until I felt “right” and sat down. A few moments later, a young man came in and sat down close by. I glanced in curiosity and he smiled,. We sat there for an hour or so breathing in the perfume of the past, breathing out the steamy breath of the present. The breaths mingled with the cold air and became absorbed. The sparrows became restless, the air turned sweet. I knew that smell – snow! Soon snow flakes joined the rain. I sensed the young man was looking at me. 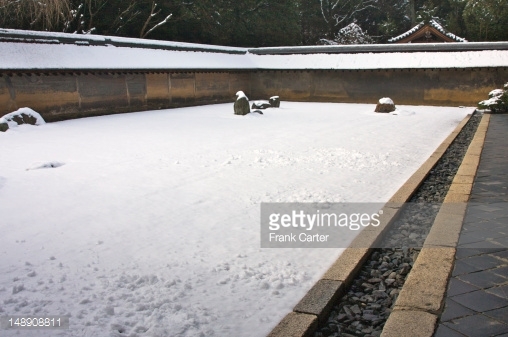 He pointed up and around the garden – hatsuyuki – first snow, he said and sweetly smiled at the sky. It was time to go. Stiffly I began to rise and he put out his hand to help me. We walked in silence to the parking lot where I would summon another taxi. He motioned me to follow him and without fear, I did. With gentle courtesy he opened his car and brought out a thermos. He handed me the cap and poured hot tea into it. I sipped quickly, thawing. A taxi pulled in the lot, trolling. He hailed the taxi for me and put me in speaking to the driver. I gave the driver my hotel and was taken there. I paid him and went inside. I headed for a hot shower and room service. I blessed my new friends who gave without asking. Today is Open Link Night at dVerse Poetics and it is #150!!!!! We do not submit to a prompt but rather, submit a poem of our choice. I have done a haibun – 俳文 – for first snow – 初雪 Please come join us. Submit your own poetry and read the offerings of very differently talented writers. Deep winter and total blackness of the night. The stillness of the night awakens me as if it had been a deafening clap of thunder. I lie under the quilt, warm and cozy but….something in the atmosphere beckons. I change into jeans and heavy sweater, socks and shoes and open the front door. Since going to bed, it has begun to snow. Ignoring the cold, I step out onto our front porch. Miraculous transformation! Smooth glowing white covering the yard. Against the blacker than the black night trees, silvery white snow has clumped into vees of little branches – night blooming winter magnolias they seem to be. I carefully go down the steps and into the yard, turning slowly to see all around. The air is cold and sweet with the perfume of snow and it is so silent…so very silent I can hear the snow falling – a slight hissing sound as tiny flakes strike against each other, slough off from each other, group together and fall.straight.down. I look up at the sky and can see the snow clouds against the black of the sky. I lift my face – bit of instant fire touching my cheeks, lips, eyelids….I hold out my hands. The stillness, the snow, the silence. I am no longer here but there – years past on the viewing platform at Ryoanji. On the wall sit hundreds of suzume – sparrows. Like me, they are watching the rocks in the 枯山水, karesansui. Feathers fluffed against the cold, tiny bright eyes seeing all. I watch the rocks, silent, down jacket pulled close against the cold. The air becomes sweet and before the suzume begin to flutter, I know…snow. I feel them on my face before I see the flakes and soon, they stick to the gravel, to the moss around the base of the rocks. The birds flutter off to more sheltered spaces but a few stay for the crumbs the humans leave behind. Ryoanji and hatsuyuki. I stay until the moss is white and the suzume have all left. Straight down and fast, the snow falls. I stand and bow the long, deep bow of deepest respect. As I leave, it comes together for me – impermance, the beauty of imperfection, the deep sadness at the passing of things – the snow that melts, the birds that fly away…and the rocks that stay behind. Silence drifts to cover rocks. to the place, their place. but it was not the first snow – hatsu yuki. She looked out her office window. was a ghost against the glass. falling petals of white sakura. Light, then heavy as the wind swirled. deeper on the parked cars. A car pulled beside her. He parked and joined her. rocks like a white shawl. until I could no longer endure the cold. It is my heart home. He looked down without asking. the snow petals falling on them. She looked at the snow. He looked at the snow on her hair. In silence they finished the walk. She smiled, a small and wry smile.